The two biggest assets that you as a home veggie gardener have in your Spring and Summer garden are Open Pollinated Heirloom vegetable seeds, and Succession planting. There are many reason why we plant Heirloom seed in our gardens, one of the biggest benefits to the home gardener is that they do not all ripen at the same time. Industrial hybrid seed needs 100% uniformity. They build machines to plant, maintain and harvest crops, if the crops are not 100% uniform, the machines don’t work properly and the harvest is delayed or messed up. Simply put, commercial farmers need to harvest the entire field on the same day. For that, the plants need to be uniform, and special seed is bred for just that reason. With Heirloom seed, the trait of uneven ripening is perfect for home gardeners, as nobody wants a glut of any vegetable in the same week. As a home gardener, the last thing you want, is to be required to harvest everything at the same time and either have to give, or if ripens at the wrong time and you can’t process, throw most of your crop away. What you are looking for is staggered and uneven ripening. This will allow you to use and process your crops over an extended period. You can plan and use the uneven ripening of heirloom seed to your advantage. It’s easy to spread that harvest of a number of weeks or months, and that’s just perfect! It still allows you some extra to be charitable with, and your planting just goes so much further. Succession planting is the next weapon in the home gardeners arsenal. To be used effectively, you need to understand how it works. It’s no good just planting all your seeds every week or two weeks in order to have a staggered harvest. And unfortunately is how most people understand succession planting. The most common explanation by ‘experts’ is to just plant every X days or weeks. Personally I’m not a fan of this technique as people often miss a ‘pre-set’ day and then give up as they missed their critical day. Proper succession planting is used with the understanding that certain crops and varieties have a bearing ‘sweet spot’, and it’s making good use of that sweet spot, and then having another variety waiting in the wings to replace it. Certain crops lend themselves to succession planting and others not. Long season crops like onions and garlic, and perennial crops like asparagus and artichokes are just pointless being succession planted. Plant them once in a dedicated bed and harvest / process when ready. Tomato seedlings in one of our tunnels. These will produce next seasons seed. So onto the meat of how to use succession planting. Check your maturity dates on the varieties that you are looking to plant. 1) Different varieties if planted on the same day will have different maturity dates. Most indeterminate tomatoes will start producing from around 85 – 90 days. And they can produce in well fed soil for 2-3 months. So in effect you only need to replant tomatoes every 2 months or so. If you add a short season determinate tomato into your planting, you can get sun ripened salad tomatoes in 65 or 75 days, that’s almost a month off your first harvest date! 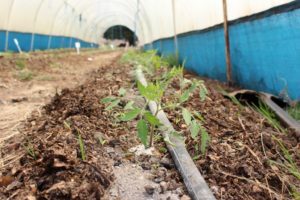 The nice part about this method is that even though you are harvesting tomatoes continuously, each variety tastes different and lends itself to different styles of cooking, ensuring that you don’t get tired of eating the same crop every week. 2) Look at what type crop you are planting. Let’s use Bush Beans for this example. It will start bearing from around 55 days and will bear well, for a good 6-8 weeks (yes I know you can push it further). So it makes sense to replant Bush Beans every 6 weeks to replace your production stock with young vigorous plants. 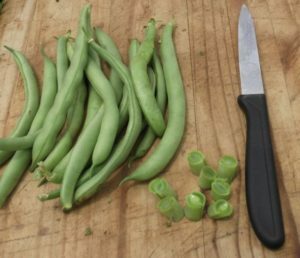 Adding Runner beans changes this dynamic, as they only start giving beans at 8 or 9 weeks, but will produce very well if picked over properly for a solid 3 months. So only plant a new runner bean crop every 8-10 weeks. 3) Cut once crops like heading lettuce can be put on a stricter schedule. It’s pretty easy to work out how many your family will need on a weekly basis. And then plant to that schedule every 2-3 weeks. 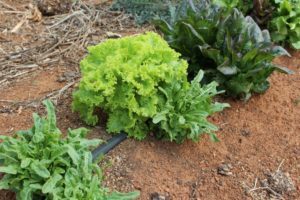 However, here again, using different lettuce varieties can extend your harvest. Loose leaf varieties are generally more heat adapted, and they can tolerate a bit of shade, which will slow down the bolting and extend the harvest. Mixed lettuce look great in the garden and on your plate. When watching your garden progress over the season, if you see that something is not working. Lift it, don’t try and coax an unhappy plant, rather replace it with seedlings that you have waiting for garden space. Having a constant seedling supply is important and you will be using crops out of your garden, as these are consumed, they will open up space for a new crop to go in. So either grow your own or order some in. Excellent advice; thank you very much fir sharing it. Please may I also be on your mailing list, always grateful. Just installed a tunnel. Any advice welcome. I like what I read ! Please add me to your mailing list. Ad me to your mailing list please. Love to be on your mailing list too, what good advice…. Please put me on your mail list thanks for the info. Great article! I’d also like to be on your mailing list.